Can you imagine a world without the Internet? It is hard to believe that the Internet is as young as it is. Trying to picture how people made buying decisions without being able to do minimal research (i.e. checking the vendor’s web site) seems hard to imagine. Back before the Internet there were sources like magazines and specifically Consumer Reports. The publication still exists and the content is really helpful, but now we have access to even more, using the Internet. Granted, the buyer still needs to beware, to ensure that the reviews and research is valid, but the available sources have increased over what was available when Consumer Reports was the only game in town. And, it isn’t just the buying decisions. 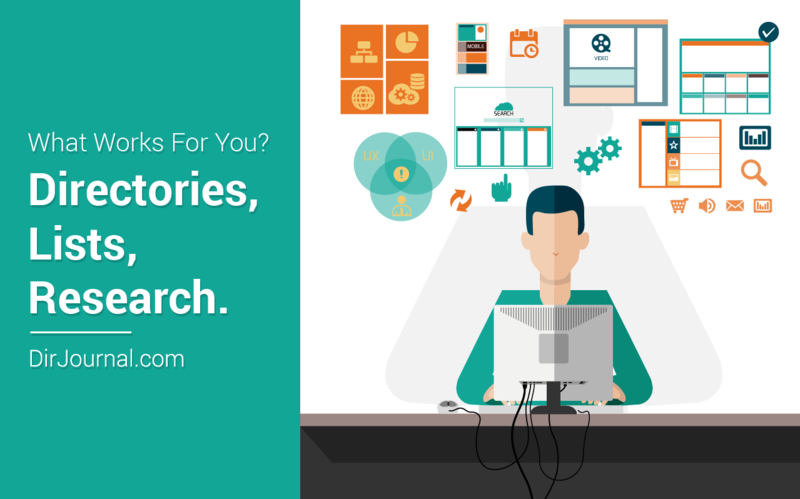 You name it and there is information at your fingertips, if you know how to find it. We are going to list three options, in this article. You are on a site that has a directory, one of the best on the ‘net. You can click on location or category and click through to the resource you are looking for and go directly to the web site. DirJournal has done the work for you in compiling sites on one site. 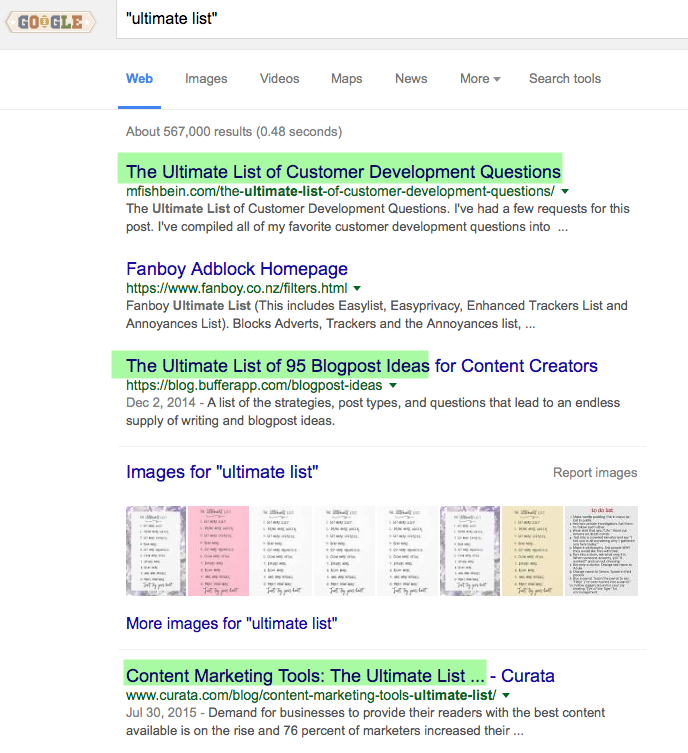 All you need to do is type the phrase “ultimate list” in a Google search and you will be met with a plethora of “lists.” This isn’t as effective for buying decisions but it is really helpful for tasks like content production, creative ideas, marketing strategies, and anything that requires an idea. Now, all you need to do is modify your Google search to include the topic of your list and you are likely to have a ton of ideas within seconds. Another idea, if you are a list creator, is to use a tool like Listly to start creating your own list. You can also pin ideas that you find, to your favorite Pinterest board. You could do the same type of bookmarking with other tools, too, like StumbleUpon, Scoop.it, or even Trello. Dave Schneider, co-founder of Ninja Outreach, knows how to create ultimate lists (check out his Ultimate List of Content Marketing Tools). He has also put together a step-by-step tutorial on how you can create your own Ultimate List: The Quickest and Easiest Way to Create a List Post That Goes Viral on boostblogtraffic.com. Check it out – you are likely to be an expert after reading and digesting his post. Some other obvious places are reviews and testimonials. However, it is even more impressive when you can find a well-researched article (similar to Consumer Reports). One such article is a review of VPN companies. I found this VPN Company Research article that is quite impressive. Similar to the list articles, there were several VPN companies who were considered and they were surveyed. This type of article takes a bit more work than a review-only (not to say that reviews do not also take authors some time). This article reminded me a lot of my college papers, where you come up with a research question and a research design. In this case, the researchers used a survey and sent it out to the VPN companies, to answer the questions (great idea, btw!). They compiled the answers in order to identify the best VPN companies and presented the top three. After giving you the scoop, they broke down the results and displayed them in graphical ways (to help us visualize it better) and also wrote about it. Check out the link, to see for yourself. After reading their research, I feel more confident on making a choice of VPN provider, especially if those candidate companies are on their list of surveyed companies. Whether you use word-of-mouth, a recommendation from a friend via Facebook, reviews, testimonials, or one of the three methods listed here, you are likely to be able to find the information you are looking for and make the buying decision or creative idea, or anything else you want to accomplish… thanks to the resources that we all have available to us via the Internet.